The oversailing cornice above a pair of panelled doors enclosing an interior with two shelves flanked by six massive tapering ebony columns with carved Corinthian capitals. 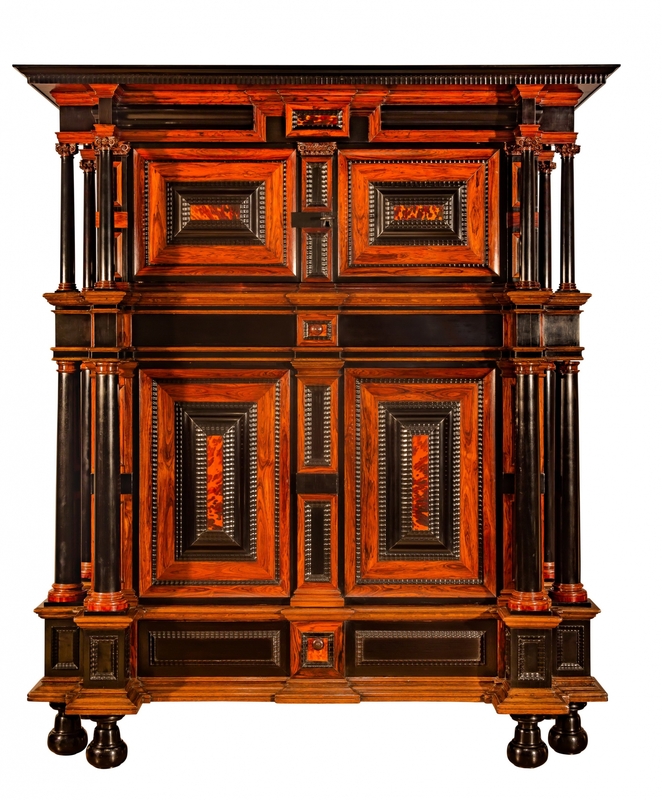 Below a pair of conforming doors, the raised panels veneered with rosewood and ripple moulded ebony. The central panels on the doors with tortoise shell. Middle and lower drawer. The inside of each door inlaid with a geometrical pattern of rosewood. The back is carefully crafted with panels within frameworks. On six replaced bun feet. Herman Doomer was born in Anrath (circa 1595) just across the German border, but was recorded in Amsterdam in 1613, where he stayed until his death in circa 1650. 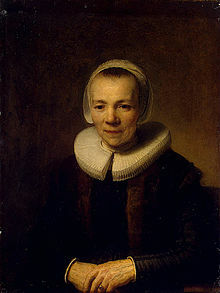 Not much is known about Doomer, whose main reason for fame initially was the portrait painted of him and his wife Baertje Martens by Rembrandt in the 1640's (the portrait of Doomer is now in the Metropolitan Museum of Art and the pendant of his wife in the State Hermitage, St Petersburg). More information can be gleaned from the four wills drawn up by Doomer's wife in 1654, 1662, 1668 and 1677; in her wills she mentions the two portraits by Rembrandt, 26 other paintings by Dutch contemporaries, and of course items of furniture. 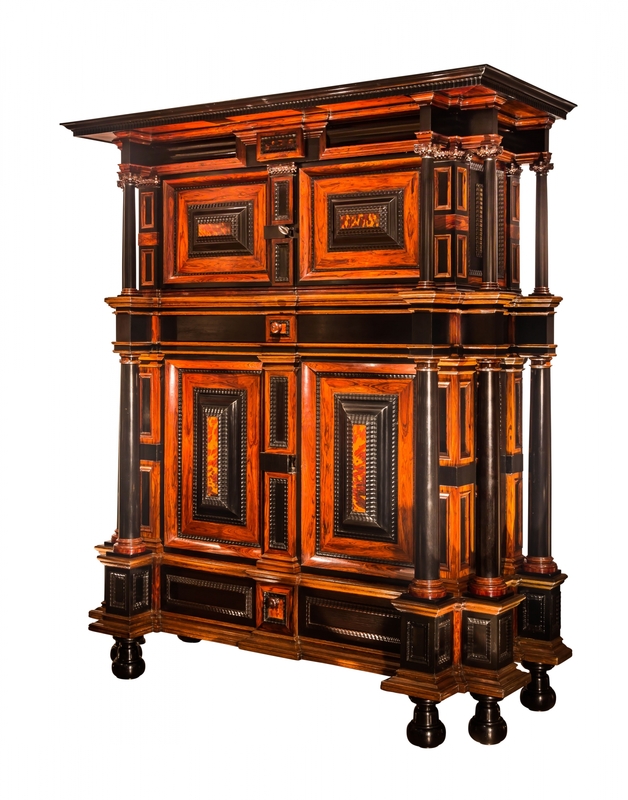 Amongst the furniture the most valuable item is a een groote ebbekas met parelmoer ingeleydt - A large mother-of-pearl inlaid ebony cupboard - which was valued at 945 florins at the time, more than half the total value of the whole inventory. 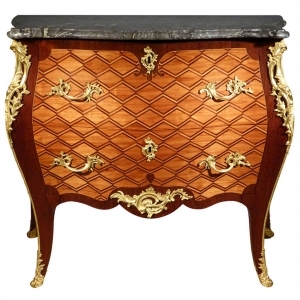 Also in the inventory are mentioned two cabinets, one inlaid with tortoiseshell the other with mother-of-pearl, and valued at 250 florins each. 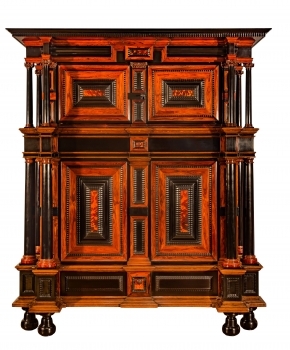 The large ebony cupboard with mother-of-pearl inlays is almost certainly the imposing cupboard in the Rijksmuseum. 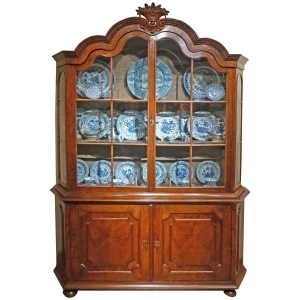 It is possible that the mentioned cabinet inlaid with tortoiseshell is the present cabinet. 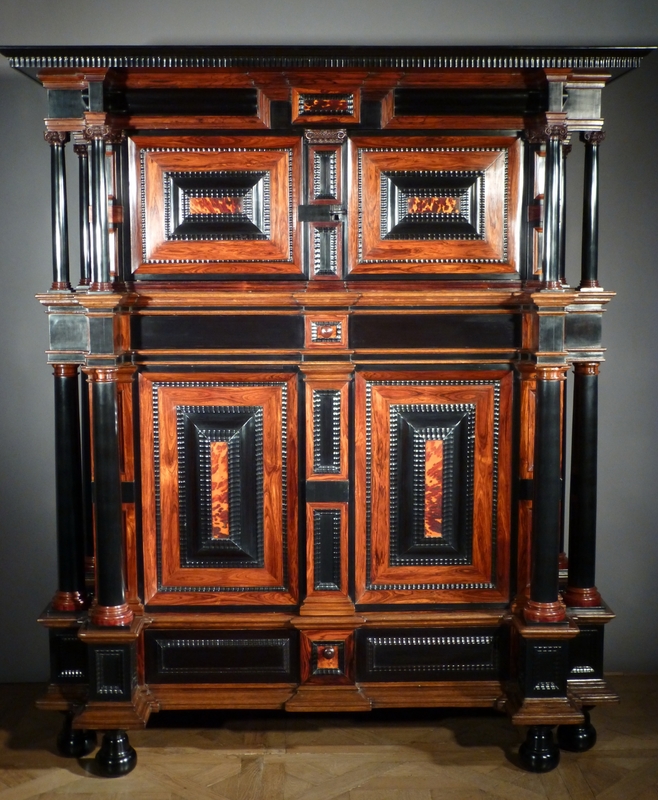 In 1613 Herman Doomer started working as an apprentice to the ebbenhoutwerker David Stafmaecker, who begun working ebony in Amsterdam in 1590, and claimed to have taught all those active in this craft in 1625. 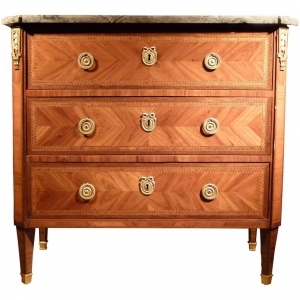 The name Stafmaecker alludes to the limited uses that ebony was put to in the late 16th century - mainly staffs, small objects and decorative elements for furniture. In the early 17th century the VOC started importing larger quantities of this exotic wood and larger pieces of furniture began to appear - such as armchairs, picture frames and caskets. 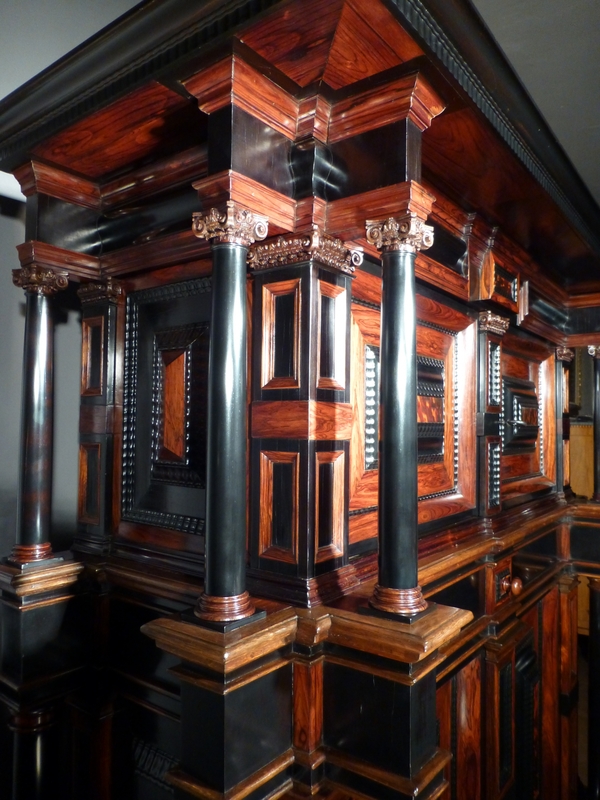 With this new development these ebony workers started using ebony veneers on oak carcasses, which brought them into conflict with the St Joseph's guild of cabinetmakers. This led to the creation of the ebony workers guild in 1626, after Stafmaecker refuted the protests from the cabinetmaker's guild stating that in order to work ebony and other tropical woods one needed totally different tools, Stafmaecker submitted his protest on behalf of Jan Willemsz. Bus, Herman Doomer and other ebony workers. This document shows that by 1625 Doomer already plays a prominent role within the group of Amsterdam ebony workers, his success is also reflected by the fact that he was able to buy a house in one of the streets between the Singel and the Herengracht, near the Dam square. Later in 1637 he bought a second house on the Hartenstraat, it was signposted "De ebbenhoutwerker". At this address, which was situated very strategic between the Herengracht and the Keizersgracht, he presented himself as one of the leading practitioners of the new craft, perhaps as the number one. Cf. R. Baarsen, Wonen in de Gouden Eeuw Amsterdam, 2007, pp. 80-109, Herman Doomer en de Amsterdamse ebbenhoutwerkers.